In the heart of the city of sassi,in via Casalnuovo, on the border between the new town and the Sasso Caveoso, rich in testimonies of the past, frescoes, altars and signs in the tuff that tell the story of matera and its millenary culture “ Hotel Casalnuovo” the Hotel is perfect for both leisure and business travel. It is located in the charming naturalness excavated in the rock of the Sasso Caveoso, the heart of materana culture, and ancient history , in a privileged position within walking distance of the following tourist sites: the Cathedral of Matera, the Church of “ Convicinio di Sant’Antonio”, Grotto House of 1700, Rridola Museum, Palazzo Lanfranchi, il Palombaro and so on. Our rooms overlook Via Casalnuovo a very quiet street with little traffic. The structure is made up of standard rooms and double, twin rooms made from the restoration of ancient “lamioni” dating back to the 1800s with barrel vaults in original tuff. 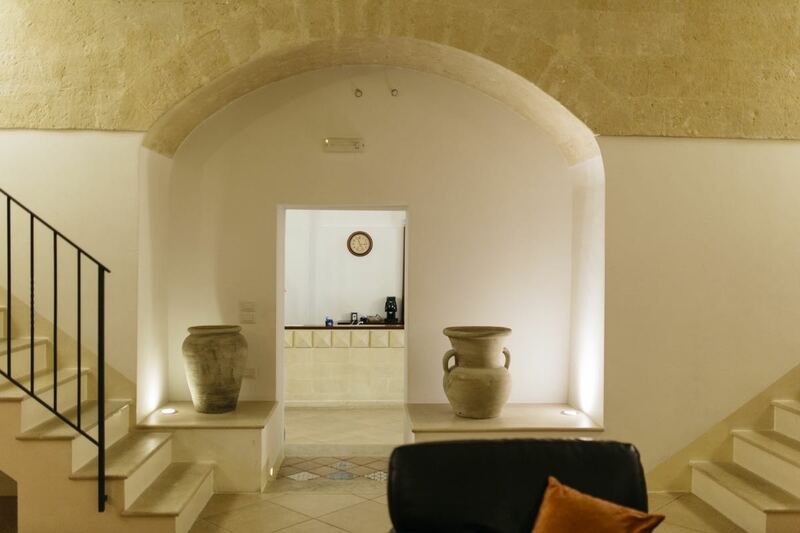 In the property you will find a lounge with fireplace and bookcase, with the latter enriched by many books on the history and traditions of the Sassi of Matera. Almost as our wonderful city has a long and interesting story behind it.The common areas are equipped with amenities and services that match perfectly with a historic and architecturally unique environment.